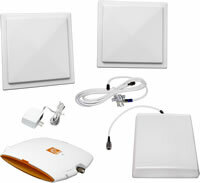 Repeater kits or cellular boosters are used when the signal inside a building is weak which allows calls to be dropped or go straight to voicemail.Â A repeater kit consists of an external antenna connected to an amplifier which provides the amplified signal inside the building.Â If you are dealing with a larger home, warehouse or office space you may need to look at a large building repeater kit. Wireless Extenders has just released their zBoost YX645 Repeater kit that, when professionally installed, increases Cellular (850Mhz) and PCS (1900Mhz) reception for voice calls and data downloads inside your home or business. Working with AT&T, Verizon, Sprint, T-Mobile, US Cellular, Metro PCS, GoPhone, Virgin Mobile, Rural Cellular & Rogers services, it can be used with any phone from Apple, Motorola, HTC, Samsung and LG as well as Broadband USB modems from Compass, Sierra, Novatel, Franklin, Pantech and Option. The zBoost YX645 Dual Band repeater kit is the higher powered 60db version of the popular zBoost YX-545 repeater kit. It contains the same base unit amplifier, but includes the zBoost YX039 Signal Antenna upgrade and the YX027 Internal Panel Antenna upgrade.. The coverage area has been increased by up to 2.5 times. Included in the YX645 repeater kit is 50ft of RG6 coax cable that connects the external antennas mounted on the roof to the internal amplifier. This longer cable allows your installer greater flexibility when discretely running the cable to the base amplifier unit.